Florida’s legislature passed HB 7119 earlier this year, which requires every homeowners association to register their community with the Department of Business and Professional Regulation (DBPR) by November 22, 2013. 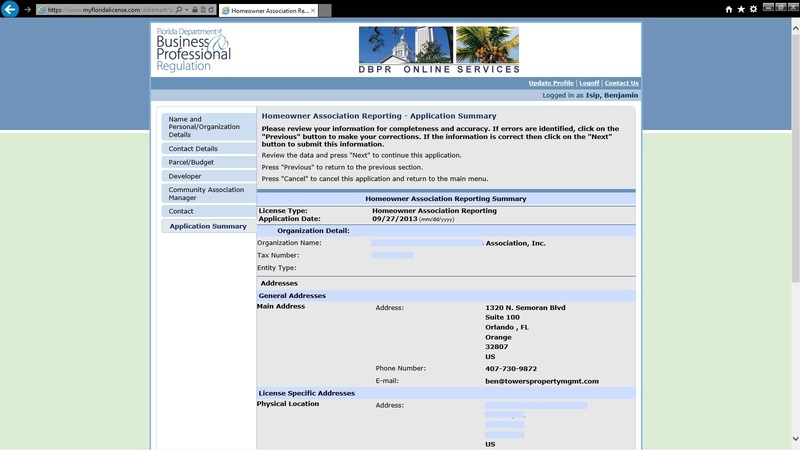 The DBPR has set up a website, and all registrations must be done online through www.myfloridalicense.com/hoa. Since this is new to everybody, we thought that we would share a walkthrough the process, in the hopes that it is helpful to other communities. To begin using DBPR’s online website, your manager should log in using their existing account for their firm or license. Self-managed associations can create their own online account through the website and will be emailed a password. A separate tutorial for that is available directly from the DBPR at https://www.myfloridalicense.com/vo/Registering-as-a-New-User.pdf. You will need to enter in the mailing (MAIN) address where the Association receives mail and other official notices at first. This is often the office address of the Community Association Management Firm that services the community, but if your HOA has an onsite office where it receives such notices, that address can be used. Then you will need to add an address for the physical location of the community, even if that is the same address as the mailing address. The number of homes in the community and the annual budget figures will need to be entered. You should be able to find these on your latest budget. If the community has not transitioned from the developer to homeowner board members, the developer’s information will also need to be entered. This includes the legal name of the developer, their mailing address and the total number of homes that are owned when completing the report. If a Community Association Manager is filling out the information, their CAM license name and number must be entered. Remember, every homeowner’s association in Florida must register by November 22, 2013! The DBPR has a Customer Contact Center that you can call at 800-226-9101 if you have any questions during the process.